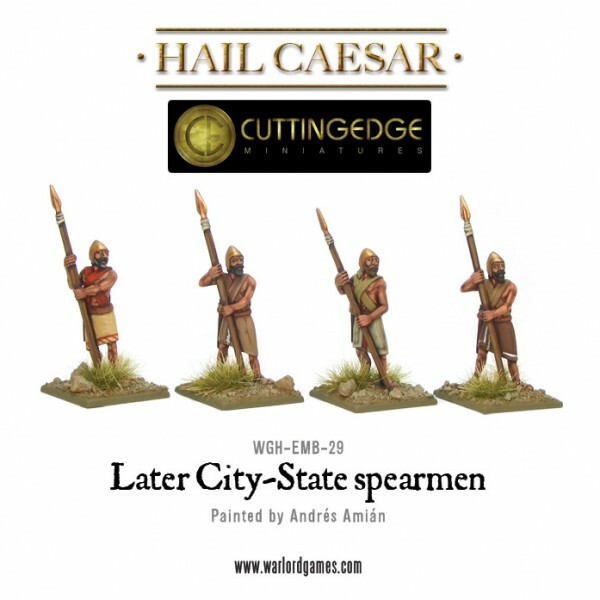 Warlord Games release the first of many 28mm Bronze Age miniatures packs from their partnership with Cutting Edge Miniatures. The first two armies are the Sumerians and the Akkadians. These figures are appropriate as the main battle-line spearmen of the Akkadian and Neo-Sumerian Successor State armies at the end of the Early Bronze Age. They can also be used in Early Elamite and Early Highlander armies as household troops or mercenaries. It is possible that the front rank spearmen did not carry a spear, but rather carried only an axe and large body shield to protect the rear ranks of the phalanx. This is dependant on how the earlier Sumerian Stele of Vultures is interpreted. Akkadian practice is taken to follow this precedent, as there is no pictorial evidence of Akkadians using shields. 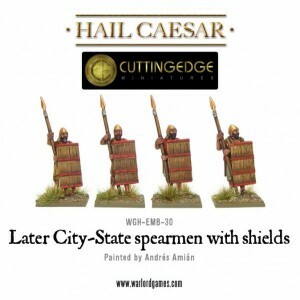 However, as some wargames rules only provide for 2 actual ranks of spearmen to represent the body of spearmen, the visual impact of a phalanx of thrusting spears would be lost if only the rear rank had a spear. Hence, these figures have the front rank with a shield and a spear and the rear ranks with a spear only. 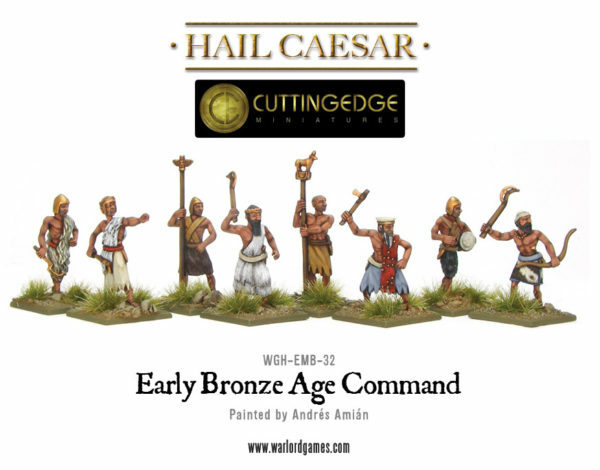 The Early Bronze Age Command models are suitable as Foot command for any army of Early Bronze Age Mesopotamia, including those of Sumerian, Early Syrian, Elamite, Early Akkadian and Early Highlander armies. 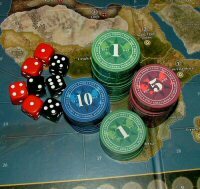 Figures can be used for characters such as Sargon the Great of Akkad, Meskalamdug of Ur, Eannatum of Lagash, Lugal-zage-si of Uruk; a King of Mari, (Early Syrian), or Kish and Chief Annubanini of the Lullubi, (Early Highlander).